Gourmandize Restaurant is currently open. Please place your order by adding items to your order. 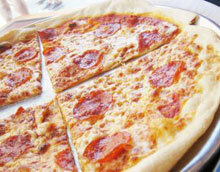 We make our own Gourmandize special pizza sauce & dough fresh everyday, all our pizza are cooked on thin crust. Please note all our sauces, dressings, pesto are made in house.